Skyscraper is the most recent action film starring the infamous Dwayne “the Rock” Johnson. This movie will make you laugh, cry, and even scream! As the movie begins, viewers see Will Sawyer (Johnson), an FBI agent, on a serious and delicate mission to save a family being held hostage. An explosion suddenly occurs, leaving Will with only one viable and working leg. While he is being treated in the hospital, he meets a woman. This woman, Sarah Sawyer (Neve Campbell), later becomes his wife with whom he has a son and daughter. Later in the production, we discover that he is not the only one in his marriage that has to do serious training. Sarah used to serve in the military. Her skills and intelligence become transparent when they are most needed. The movie is set in Hong Kong, China where the Sawyer family is staying in a very technologically advanced hotel. An enemy of the owner of this beautiful hotel has a goal to retrieve a chip that the owner possesses. Will Sawyer attempts to protect the owner, but while doing so, begins to have tension with a dangerous man who is trying to harm anyone who crosses his path. He threatens Sawyer’s family numerous times. A fire suddenly breaks out in the hotel. As a result of the hotel’s advanced technology, almost all of the people in the hotel are able to be safely evacuated, but Will’s enemy tampers with the system. As a result, Sawyer’s children and wife are trapped in their building. Trying to find a safe way out of the building, they encounter and defeat numerous antagonists. Once again, Will is put into a situation where he has to rescue the hostages. But, in this case, it is his wife and children in a burning building! 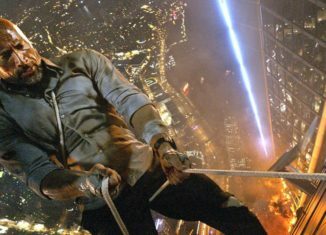 Skyscraper truly incorporates different genres in one movie, allowing it to be enjoyable for everyone. I would highly recommend this movie to people of all ages!